Urban Horse Promotes a Set of Quilted Travel Boots by Polly Products. 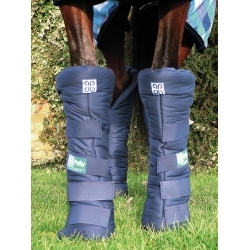 These 4 x Set of Travel Boots have a cotton outer with extra thick filling. Matching 4 strap closer, lightweight and practical, easy to fit and machine washable. Stylish, luxurious and practical protection for transporting your horse! Travel Boots - Made from the Finest Quality Materials but Affordable!